Residents of the Minneapolis-St. Paul Region are letting their feet off the gas. According to the Twin Cities’ Metropolitan Council’s decennial travel behavior survey [PDF], vehicle trips in the Minneapolis-St. Paul region dropped 18 percent between 2000 and 2010. People who reside in the area are making almost 1.5 million fewer car trips a day than they did at the beginning of the last decade. The region added about 200,000 people over that time. 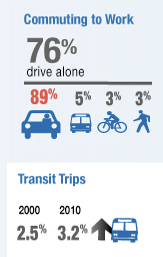 Between 2000 and 2010, transit use inched up to 3.2 percent of trips from 2.5 percent. The Minneapolis region added its 12-mile Hiawatha light rail line in 2004 and has also added some express bus service. But that doesn’t totally explain the reduction in overall vehicle trips, which still account for 84 percent of all trips in the region. A rise in telecommuting and online shopping is another factor. Between 2005 and 2010, telecommuting rose 73 percent, Metro Council says. The well-documented trend of young people driving less and delaying getting drivers licenses appears to be at play as well. Minneapolis-area planners also think people are just making less discretionary trips, perhaps trying to rein in spending because of rising gas prices and a rocky economy. Gas prices doubled between 2002 and 2011, the organization points out. One very clear positive sign is the growing popularity of living in the central city. According to Metro Council, 23 percent of the region’s population growth between 2000 and 2010 occurred in the cities of Minneapolis or St. Paul. In the previous decade, it was just 5 percent. Angie, I’m working on a county-level VMT analysis for an upcoming streets.mn post. While the Twin Cities core saw a reduction, there are nearby counties that continue to see increases in their VMT, so it’s overall still a mixed bag. In the Twin Cities, people living in multi-family housing - apartments, condos, or any kind of dwelling that shares walls with its neighbors - travel by car 25 percent less than people who live in single-family homes. And they get around by walking, biking, and transit much, much more.